Internationally recognized, multiple award-winning actor John Kani is the lead actor in this drama which he also directed. Nothing But The Truth is a gripping, sometimes funny investigation into the complex dynamic between those blacks who remained in South Africa and risked their lives to lead the struggle against apartheid and those who returned victoriously after living in exile. 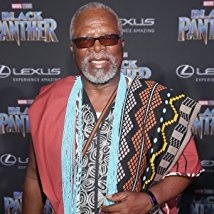 John Kani was born on November 30, 1942 in New Brighton, South Africa as Bonsile John Kani. He is an actor and writer, known for Black Panther (2018), Captain America: Civil War (2016) and The Ghost and the Darkness (1996). He won Broadway's 1975 Tony Award, along with his co-star Winston Ntshona, as Best Actor (Dramatic) for "Sizwe Banzi is Dead and The Island." Was also nominated with Ntshona and Athol Fugard as co-authors in the Best Play nomination for the same production. Kani lost his left eye during a beating by South African police after returning home from a Broadway production of "Sizwe Banzi Is Dead", which was critical of Apartheid. He survived after being left for dead and subsequently won a 1975 Tony Award for his performance.